Towards the end of the 50s, Saab management had begun to realize the need for an exclusive distributor, with its own dealer organization in Sweden, a distributor that did not have to divide its attention between Saab and competing makes. 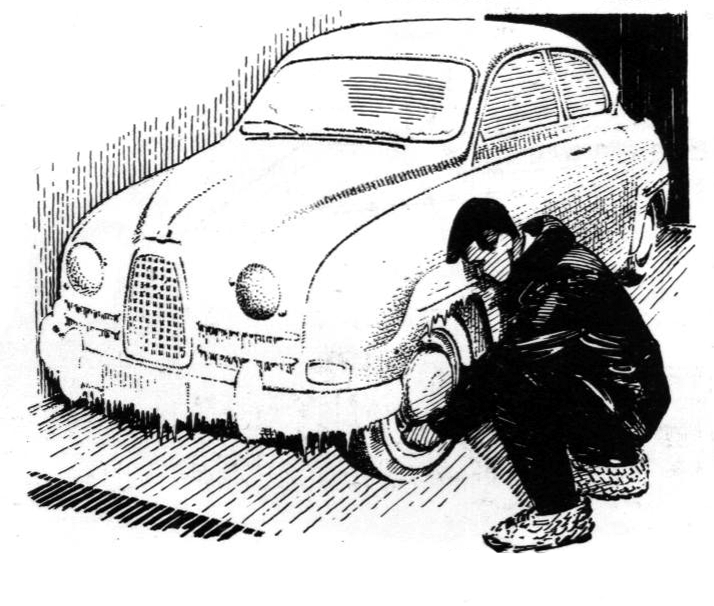 The problem was solved by the purchase in the spring of 1960 of Nykopings Automobil Fabrik, ANA, which as a wholly owned subsidiary took over Saab distribution in Sweden in September of the same year. Saab-ANA, as the company was called, could already during its first year report a resounding seccess. A total of 19,808 Saab cars were registered in Sweden between September 1, 1960, And August 31, 1961, a considerable increase in volume, and in Saab's share of the total Swedish car market. In 1959 Saab had about 6 percent of the market; in 1961 the make was responsible for 11.4 percent. 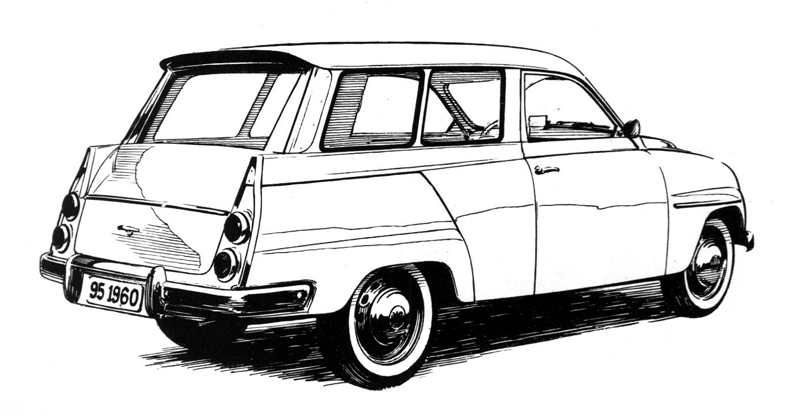 Of the 26,000 Saabs built during 1960, 5,000 were of the older 93 F model. Stores of "old" engines and parts were far from depleted when 96 productionn began, so the assembly line produced a mixed bag for a while. As a matter of fact, the 748 cc engine was retained even longer, in its GT version. The Granturismo model remained in the cylinder volume class under 750 cc, until superseded by Saab Sport in 1962, even though it already had both 96 body and a four-speed gear box in the spring of 1960. The competition and testing departments didn't want to see any series-produced sports engines with the new size, until one had a chance to try some new ideas. These ideas led to the creation of the Formula Junior race cars, with which Saab surprised the motor racing world in the late fall 1960. The cars did pretty well in many races, but very pronounced understeer did create handling problems. After the birth of the Granturismo in 1958 it became sort of a tradition at Saab that cars were modified, or that something new was introduced during the running model year. The actual 1961 models came out in the fall of 1960 and offered key-operated ignition, and changed upholstery. Then in the spring came a number of other changes, including grey wheels, and a host of color and detail changes. The station wagon, by new being built in Trollhattan, received 96 instrumentation and an airfoil at the rear and of the roof. The airfoil helped direct air downward past the rear window, and counteracted the low air pressure at the rear, which always has created problems with dirty rear windows on station wagons. Saab test equipment included from early days a cold chamber where entire cars could be deep frozen. One couldn't always expect extremely cold winters to test new constructions or different systems and functions at very low temperatures. A Swedish car has to be able to withstand a Swedish winter. Saab created a sensation in the fall of 1960, when a couple of brand new Formula Junior race cars showed up, first at the Gelleras track at Karlskoga, Sweden, and then at the Djurgerds Race in Helsinki, Finland. The fiberglass nose protected an inclined three-cylinder two-cycle engine developing some 70 hp. Some of 95 wagons produced in 1960 had this appearance. Doors had been turned the right way - hinged in front - but the airfoil for the rear of the roof had not yet been installed. The Granturismo 750 model was continued with the smaller engine, but in 1960 it did get the 96 body. Chromed wheel-discs, double body side moldings and opening rear windows with chrome frames were some of its distinguishing features.